How to Unroot Samsung Galaxy S3! [No Computer] [AT&T/T-Mobile/Verizon] ~ AndroidRootz.com | Source for Android Rooting, ROMS, Tricks and More! This guide do NOT require a computer at all! So technically this guide is also compatible with a Windows, Mac, and Linux computer. This will remove EVERYTHING on your internal SD card so back up all your contacts, apps, music, ect if they are on your internal SD card! What will unrooting my Samsung Galaxy S3 do to my phone? If you follow this process step by step it will completely restore your phone back to 100% complete stock, just like the day you bought your phone. It's also safe enough to send back to Samsung without Samsung knowing you ever installed ClockworkMod Recovery or rooted your phone. 1. Download Triangle Away app directly onto your phone: here or get the donated version from the Google Play Store. 2. Locate where you downloaded the Triangle Away apk and install it. Note: If you get a security issue make sure you have "Unknown Sources" checked marked under security in settings. 3. Tap on "Reset flash counter". 4. Next, download and install Odin Mobile app from, here or get the donated version from the Google Play Store. 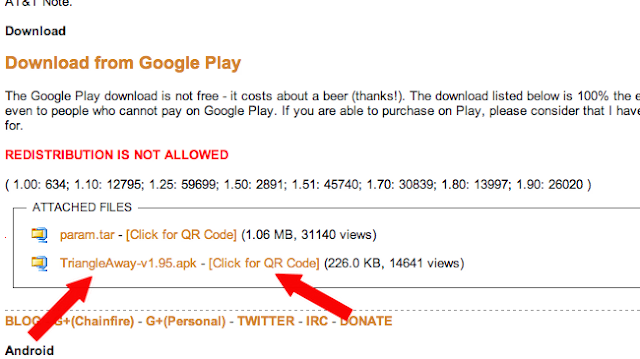 Note: If you download the free version you may have to install an add on from the XDA forum. 5. Download / Transfer one of the zip files to your phone from the links below.